It's time for another Korean beauty review! Continuing last week's Honey & Black Sugar Scrub theme, I decided to follow up with something else Honey. 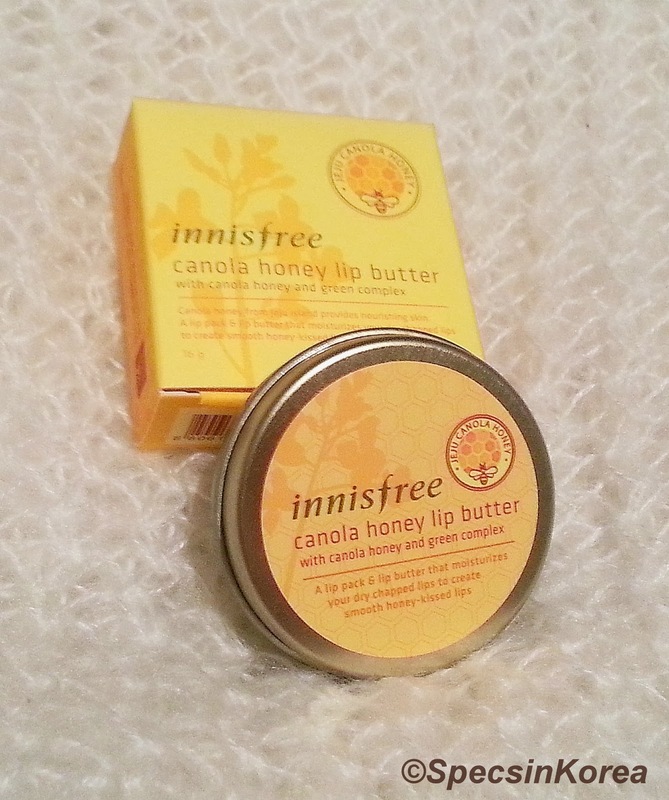 I present to you Innisfree Canola Honey Lip Butter! "A lip pack & lip butter that moisturizes your dry chapped lips to create smooth honey-kissed lips"
I have to confess - I am a lip balm junkie... No kidding, I have 4 different kinds of lip balms, and I'm using all of them in rotation! Once I find ones I like, I stock up like crazy (I have two little tubs of the same balm open now..), but I keep looking for yet another to add to my stash. A big part of that is because I cannot stand the feeling of dry lips. I'm often biting/licking my lips, and it comes with a price. For the last 3 years or so I have been faithful to one kind of balm - Baviphat Peach Lip Balm (and the Peach Tint from the same line). They smell amazing, and they were cheap to get, even though I had to get them shipped from Korea. However, once I actually moved to Korea, I started looking around for other options. I'm usually big on lip products - lip glosses, lipsticks - I have a million of them. But I always get annoyed around the second time I need to reapply, and just go for my lip balm instead. Thus, I decided it was time to branch out! Innisfree came to be one of my top favorite brands, not only from Korea. They always highlight the fact that they use natural, locally produced ingredients (Jeju everything). Over my stay in Korea I got to test multiple items from their ranges and so far, everything I've used turned out to be wonderful. As for makeup, I've only tried a couple items, but whenever I was going around their shop, either just browsing or looking to buy something new and exiting, I would always, without fail, swatch their Canola Honey Lip Butter and would have to drag myself away from the counter. As you might remember from my last review, I am a huge fan of honey - it's a staple in my pantry, as well as my beauty regime. So it's no surprise that the Canola Honey line always caught my eye. BUT I never purchased anything from it, for two reasons - firstly, it's on the pricier side. I get it, it's very natural, but I could never work up the courage to spend 8 bucks on a lip balm. Second - it's honey. It can be tricky to use so it doesn't irritate the skin, and I have really sensitive skin. Thus, I always gave the line a 'perhaps tomorrow'. However, as it usually is with me, once I went back to my home country, and thus was unable to actually purchase the balm, I had to have it. Childish, I am aware of that! But bear with me. I fiddled with my Ebay shopping basket for around two months, finally, a month ago, clicking the 'Pay Now' button and purchasing the balm. It arrived pretty quickly, and, naturally, I was overjoyed. As you could see in the first photo, the packaging is very lovely, and appropriately 'honey' themed. It's very simple, yet charming and has that old school vibe to it. I don't know if you can tell, but even the tin has a slight golden tint to it - well played, Innisfree, well played! Like all Innisfree products, it's packed in a recyclable cardboard box, with soy ink printing. I find it a really nice touch to the company's 'natural' image. Once you open the tin, you will immediately be captivated by the scent - it's pure honey. 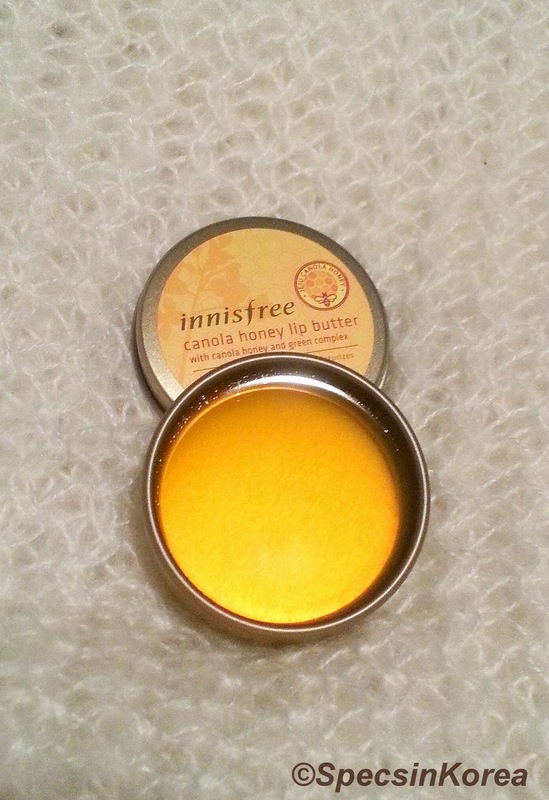 And I have to hand it to Innisfree - there is nothing artificial about the scent of this balm. Personally, I love the smell of honey, however, this is canola honey so it is a very sweet scent. And I do have to admit, even I get a little sick of it after a while. The next thing you'll notice, as you can see in the picture, is the beautiful golden color of the balm. Balm itself is completely clear, and I find it very cool that you can see through it...what can I say - simple things amuse me. The color, as well as the scent, simply screams honey. Although I've never seen honey that's just purely yellow, it doesn't seem artificial at all. But as I've mentioned, on the lips the balm is completely clear. Now here comes the texture. When I first opened the tin, I expected the texture to be like honey - on the soft side, slightly squishy and perhaps a little runny. I was wrong. The texture of the balm is very traditional, albeit on the sticky side. Once applied on the lips, it does feel more like honey, as it has that smooth, slick feeling to it. Unless you drink/eat, the balm will stay for a long time. I usually apply it before sleeping, and wake up with a good deal of it still on my lips. My lips are very soft and no longer chapped when using this, so it does live up to the claims. Plus, I really love how my lips have that slightly wet look to them, not too glossy, just the right amount. So, as far as the claim of 'giving your lips that honey-kissed look' - it delivers. As you can see (forgive the quality), the lips are smooth and hydrated, without a single dry patch in sight. Love! Personal advice - don't blot with a tissue, it will remove the moisture together with the balm! Apply your lipstick and enjoy the smoothness of your lips! The only real downside I found is that this is housed in a tin. Which means, you'll have to dip your fingers, and are likely to be left with excessive product on your fingers after application. If you want to avoid dipping your fingers - I suggest a small lip brush (EcoTools have a set of tiny brushes that would work well for this purpose). I personally don't mind dipping my finger in, it's the excess product that peeves me! I fell like I'm wasting the balm, so I usually put the leftovers on my cuticles. To sum up - this is a really great lip balm, it provides plenty of moisture, has a very pleasant consistency and contains mostly really good ingredients (and only a few - less is more!) Although it's a little pricey, difficult to get and you have to apply it with fingers, thus wasting some of the product, it's definitely worth checking out! Verdict: Are you a honey person? Harsh Autumn winds hurt your lips? You'll want this! Hope you've enjoyed my review! Have a lovely week, and stay tuned for further posts. Comment if you have any questions! Mind checking out my review on it please?